If the idea of marauding hordes of Tartars riding with raw meat under their saddles to tenderize it just in time for a nice snack after some pillaging sounds appetizing to you, then you’ve probably tried steak tartare. Ok, we don’t really know if that’s the origin of the dish, but that’s the historical rumor. As most cultures have their own version, who can say for sure? So, in our continuing quest to conquer the Omnivore 100 list, we’ll explore a couple of variations. The usual definition of a traditional steak tartare is finely chopped or diced (not sliced) raw beef marinated in wine, and served with accompaniments like capers, onions and a raw egg on top. But this classic version has long been left behind by adventurous chefs putting their own stamp on it, so that now it’s common to see steak tartare listed on menus with the only similarity across the board being the raw beef itself. Most of the French restaurants in town will have a classic steak tartare, like Bistrot du Coin, which features the above-mentioned egg yolk, condiments, and french fries. You could also try Beck or Central (featured as both an appetizer and an entree) for reliable versions. My first experience outside of the traditional version was at Zaytinya, where they serve Kibbeh Nayeh, the Lebanese style steak tartare chopped up with bulgar wheat, radish, and mint. It was interesting, but just not to my personal taste – I’ve never been able to get into bulgar or radish, but that shouldn’t stop you from trying this specialty. My second experience was one I didn’t think I would like at all – Ethiopian kitfo. It’s turned out to be my favorite. 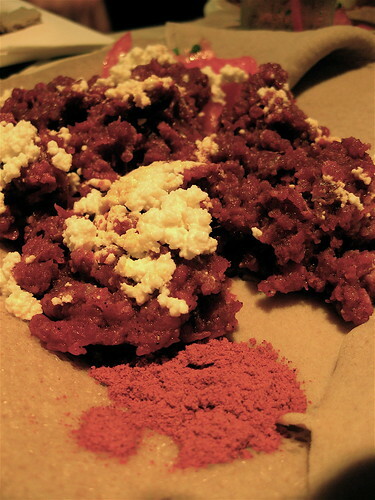 You can get kitfo at any of your favorite Ethiopian places. Dukem has three versions of kitfo and also one gored gored (actual chunks of raw beef). The Dukem Kitfo is mixed with home made cottage cheese, herbal butter, cardamom and mitmita (orange-red chili spice) and is absolutely fabulous. You can order all the kitfos to your liking – raw, medium, or well-done – but really, why wimp out? Why? Well, I did hallucinate that night, but it could’ve been the honey wine. In any case, any nervousness my friends and I may have had quickly vanished as the tender delectability of that kitfo melted in our mouths. I’ve also loved Etete’s (but really, what isn’t good there?). With all the choices around town, I’ve never experimented with making steak tartare at home, and honestly, with the risks involved I just don’t think it’s a good idea unless you have a super reliable butcher. So let us know your DC favorite versions of the pillagers’ delight (and if you actually have said super reliable butcher and your own recipe, please leave recommendations! ).